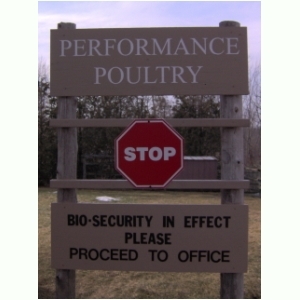 At Performance Poultry we consider bio-security an important precaution in helping to maintain the health of our breeding birds. While it may not be the most appealing program for some customers because they cannot see the birds, it is effective and therefore necessary in the health management of poultry. Recent developments with avian influenza have driven home the importance of our commitment to bio-security. From day one, we have had this program in effect, it is not foolproof, but it can greatly reduce the chances of your birds coming into contact with contagious disease.